PETER J. RANDOLPH was born and raised in the West End of Cincinnati, Ohio by his parents, Lewis Herman & Zella Mae Randolph on October 11th, 1931. He was the fourth of eight children (four boys and four girls). He grew up in the Roman Catholic faith and attended Holy Trinity grade school, DePorres High School and received his B.S. Degree in History and Political Science at Xavier University in Cincinnati. He received his Doctorate of Law from the University of Cincinnati. He has always been successful in balancing the three most important elements in his life: family, legal career and community involvement. 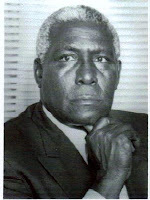 He was the first Black high school student in Cincinnati to become “Mayor of Cincinnati for a Day” in 1949 and he was the first “Mayor for Xavier University’s Operation Youth” in 1950. After receiving his LLD from the University of Cincinnati, he served two (2) years in the U.S. Army. After an Honorable discharge he took his bar examination and passed on the first attempt. He became a Referee and Attorney Examiner Claims Hearing Officer for the Bureau of Workers’ Compensation and Industrial Commission. Now 40 plus years later he is one of the few Black Attorneys in Cincinnati specializing in Workmen’s Compensation Law. His law practice covers the areas of Workmen’s Compensation law, Probate law and Personal Injury law. He is married to Mary Ann (Littlejohn) of the West End and of that union he has four children: Lisa Marie, a former bailiff for Municipal Court Judge Cheryl D. Grant but is now his Paralegal and has her own photography business called RANDI’S FROZEN MOMENTS PHOTOGRAPHY, www.randifrozenmoments.com. Lisa was also a disc jockey at WCIN Radio during the 1990’s and she was affectionately known as “RANDI”; Paula Ann (Hollins) a supervisor at the UPS Company in Gary, Indianan; Peter J. Jr., an associate property manager for “Simply Self Storage” and manager of R & Y Apartments complex; and Jason Alexander an attorney & sole practitioner in real estate law with his own law firm named Jason A. Randolph, Attorney at Law, based in Atlanta, Georgia. Jason does real estate throughout the entire state of Georgia. He feels that his greatest achievement in law, to date, has been the 1989 MALLORY vs. EYRICH case. Prior to that case the Hamilton County Municipal Court in Cincinnati, Ohio, had no elected Black Judges over a 20 year period (1965 through 1985). In 1989 he joined a team of 6 Black attorneys who took on the State of Ohio and 18 defendant attorneys. After a 7-year struggle, the Black lawyers were victorious. As a result of the MALLORY case today there are six elected Black Judges to the Hamilton County Municipal Court out of the 14 judges with the possibility of more in the future. Today there are four Black Judges in the Hamilton County Court of Common Pleas. He feels that the catalyst to the increase in the amount of Black Judges was the MALLORY case in which his wife, Mary Ann, was one of the plaintiffs along with former State Senator, William L. Mallory, Sr., who had previously served 28 years in the Ohio House of Representatives. He is a past president of the Evanston Community Council; Life member of the N.A.A.C.P. ; past director of the Board of Seven Hills Neighborhood Association; Member of the Black Male Coalition; First Grand Knight of St. Martin DePorres Council Knights of Columbus; Member of the Black Lawyers Association of Cincinnati (BLAC); Member of the American Trial Lawyers Association; Member of the Ohio State Bar Association; and a member of the Cincinnati Bar Association; former president of the Wesleyan Cemetery and an Archon in the Alpha Delta Boule’. Attorney Randolph has been inducted into the National Bar Association’s Hall Of Fame. He has received many other honors and recognitions, such as the Certificate of Recognition from the Ohio State House of Representatives for outstanding services in the community; the Cincinnati Chapter of the Urban League’s Glorifying the Lions Award for outstanding services in the community; honored by his parish, St. Mark’s Catholic Church as a Martin Luther King Honoree, just to name a few. What a wonderful article about such an honorable man as attorney Randolph. Cincinnati is truly blessed to have the likes of such a personage as Peter J. Randolph Attorney at Law, right here in the tristate. Congratulations! Attorney Randolph is an example of what hard work, determination and following the path that was/is his and is also a trailblazer for young attorneys who want to know how to get it done right and without compromise.. This is great. Attorney Randolph passed away a few days ago and his funeral service is on Saturday. The Black Lawyers Association of Cincinnati will miss him.